People talk a lot about"how much luck" a game has, without a lot of specificity as to what that means. Sure, most people are talking in general terms anyway, so there's not a lot of need to deconstruct it, but where would be the fun in that? I think a decent model for deconstructing "luck in games" as follows: Each player has a "skill" (S) which we'll treat as constant over the span of a single game. Over time this may improve or degrade. 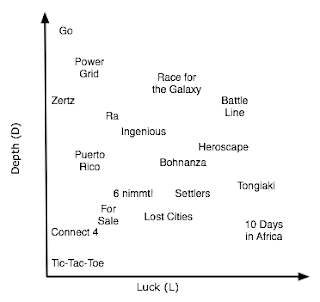 Second, each game has a distribution of "luck" (L) or "random factors". Finally, each play of a game, there is a distribution of "performance" (P) or "how well you played". Then to determine the winner, we take S+L+P for each player (where L and P are random variables) and whoever is higher ends up winning. For some games, such as chess, L is essentially 0. Additionally, the absolute values of these don't really matter, so we can just put some stakes in the ground. Let's just define a "typical novice" as having S=0. Of course, this means some people have negative skill, but that's fine. I also believe that while there are variations in P, from game to game, that it's actually relatively constant. So, let's define P as being a gaussian with variance of 1. When talking about a game, we regularly talk about its "depth" and learning curve, and let's call the difference between S for a "world-class" player and a novice "D", for depth. The units for D are defined by the fact that we've defined P as variance 1. Tic-Tac-Toe has a D well under 1, while something like Chess or Go could easily have D of dozens or higher. Another way to think of D (for games with no luck) is "how many distinct levels of play does the game have?". So, if Joe is a novice at a no-luck game and he is always beat by Fred, and Fred is always beat by Mark and Mark is usually, but not always beat by the best players in the world, then that game is D=2.5. For games with luck, the number of distinct levels of play is roughly D/(L+1). The notion that P is fixed variance of 1 breaks down for games with no choices, like Bingo, because it leads to L being infinite, but I'll ignore that problem for now. Now, this model has some issues. It doesn't represent atypically non-linear skill curves well. It doesn't handle cases where the performance variation is strongly skill-dependent, or where there are other cross terms. It doesn't model "style" differences well, where you might get circular skill relationships. But, I think it does alright at representing the relationships. Other than being a fun toy model, I think this actually is a useful, if arcane, way to talk about games. Further, it highlights a category of game I suspect I like more than most people. What I really want in a game is one where L>1 and D>2*L. Further, I mostly don't want D to get too high though, as that makes it too likely that opponents will be badly mismatched. That is, I want a game where luck is more important than how well you play in a particular game, but long term experience trumps both of these, but not by a huge factor. In this kind of game, there's enough luck and variation depending on the players' performance that a novice has a chance, albeit a very small one, against an expert. The most useful thing this illuminates for me is that I like high-luck, high-depth games. Unfortunately, there's not a ton of them. Heroscape, Race for the Galaxy, Battle Line, Lord of the Rings, and Funny Friends (sort of) are decent examples though. Further, I often find myself arguing that these games are not "high-luck" (contrary to what I just said), because I think a lot of people when they say high-luck mean (L/D) and these all have reasonably low values for L/D. But, maybe I'm misinterpreting, and people mean L/R, in which case they're right, the game is high-luck, but that can be more than made up for with experience. What other high-luck, high-depth games would you recommend? A lot of people clearly have strong biases toward the left edge of the plot, or the upper left, or even the center. Where on the plot do you tend to prefer? Or, is the plot even a useful breakdown to anyone other than me? I like this characterization. I also find myself drawn to many high-luck/high-depth games, but with the additional property that they should be relatively short. A high-luck 3-hour game is usually not a good thing. I particularly liked the comparison in your chart between Lost Cities and Battleline, that Battleline was higher depth but also higher luck. I have had arguments in the past with people claiming that Battleline had more depth, where they tried to deny that there was much luck to the game. Another high-luck/high-depth game I would recommend is To Court the King. I think in BattleLine, use of the Tactics Cards is what adds most of the depth and allows you to exceed the luck with skill. I'd put Schotten-Totten far lower on the depth scale. As I said, I'm probably one of those people claiming BattleLine has "less luck" simply because L/D is fairly low and the learning curve isn't that steep. As for To Court the King, I enjoy it a great deal, but am finding that after 15 games, I'm not sure there's really that much depth. In fact, I'd put it at somewhere around L=2, but only D=3, down around Tongiaki. But, maybe I'm just not seeing the depth that's there. I like this view very much. I agree it's ambiguous what people are referring too when they say "too much luck". I see that most of my favorite games fall high on your "depth" scale. From there, I generally like the ones on the "high luck / high depth frontier". Schotten Totten and RftG are among my favorites. I also enjoy Go and Through the Desert though, and those have arguably no random elements in them. Still, neat thoughts. Maybe I should give in and try Funny Friends. If only Friedman's games were easier to explain to casual gamers. I like Depth. I can't detect any pattern for my likes in the X scale, but I definitely go up in score the higher the depth on average. In the case of mismatched opponents, I see a problem, but I'd still prefer high depth games with opponents of similar skill. Actually, It would be interesting if we could assign real values to some games and then make a diagram of it. On another note, I'm still very actively looking for more high depth dice games... I thought To Court a King was going to be it, but after playing it I don't think so. To Court a King is a low Depth game. Knockabout is currently THE dice game to beat - with high depth and medium luck. I don't quite understand how you calculate D for games that do have a high L. What makes Puerto Rico and Bohnanza have the same value of D? 1) As with L=0 games, if two players play as well as you'd expect for their level of experience and both get equally lucky/unlucky in the game, how many "levels of play" are there? I also think of this as a duplicate scenario, a la duplicate bridge. 2) If a world-class player gets fairly unlucky in a game and a novice player gets fairly lucky, will the novice win? If yes, L>D, otherwise D>L. Bohnanza and Puerto Rico each have a moderate number of levels of play in my mind, it's just good or bad luck in Bohnanza has a higher impact, and therefore a "lower level" player will more often beat a "higher level" player. This is interesting, and a neat perspective. It's the kind of thing that sort of exists on BGG (there's "weight", which definitely isn't "depth" but maybe encompasses it) and would be awesome if it really existed. I think it would be useful to be able to look at a game and see a scored ranking of it's luck and depth by different people (much the way rankings exist for 'fun' on BGG now). I tend to like depth at all times, and nonzero luck. The problem of mismatched skill is a problem that just makes some games less popular (chess), but in some ways makes finding satisfying games of that nature more enjoyable.